Villagers in Essex have found an unusual way of fundraising - by filling up on desserts from around the world. Rather than run another village fete, residents in Terling, near Chelmsford, host the "International Trifle Festival". The event started last year with villagers using recipes from as far afield as Wales and Australia in the hope to impress the judges and raise money for the local church. Organisers said they expected Sunday's festival to again have a worldwide flavour as well as a large number of villagers and visitors ready to put the trifles to the test. Organiser Hetty Taylor said "This year we're going to have a French trifle and certainly a New Zealand trifle entering the competition." 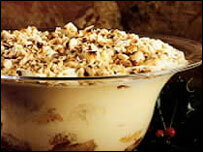 However, she also warned there could be some trifles which may not suit everybody's taste. "I don't know if we're going to have any bizarre trifles - last year we had a breakfast trifle with bacon and eggs," she said. "The same person was threatening to do a Sunday roast trifle but she thinks the Yorkshire puddings might go soggy." Money raised from the festival is donated to the village's All Saints' Church.